The app updates from the last week seem to be all about where you are, where you've been, and where you're going. It has only been a few days since Google Play services 7.8 began rolling out with a couple of location-related bits hidden inside, and now a new version of Maps is hitting the scene with a host of new features centered around our location history. We can now look back through the places we've visited, when we were last at certain spots, and the routes we've taken. There are also a couple of new personalization features that will make our favorite spots a little more accessible. 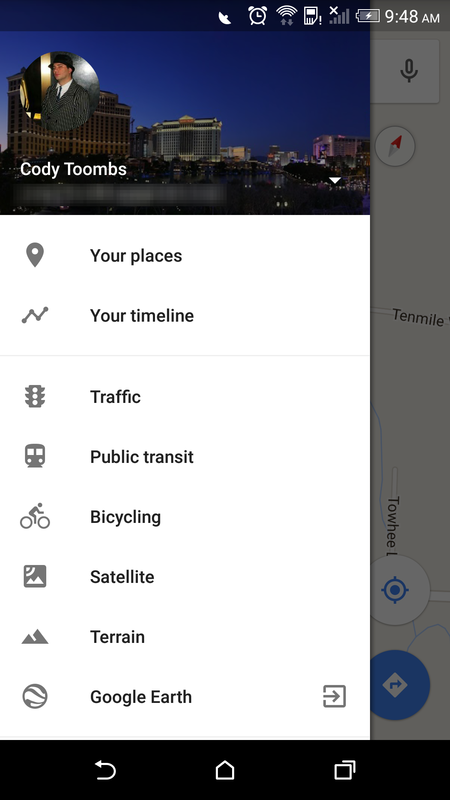 There's a new section in the Maps navigation drawer entitled "Your timeline." It leads to a screen where you can see a fairly detailed history of the places you've been. 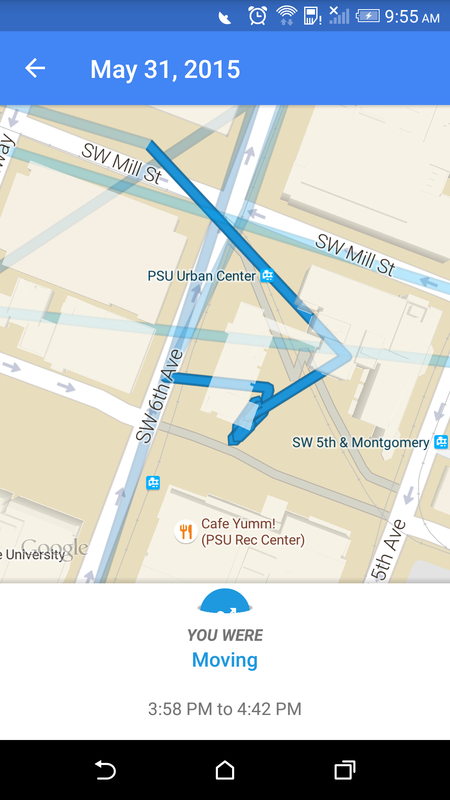 If you've ever visited Google's Location history page, this is basically the same thing, but massively better. 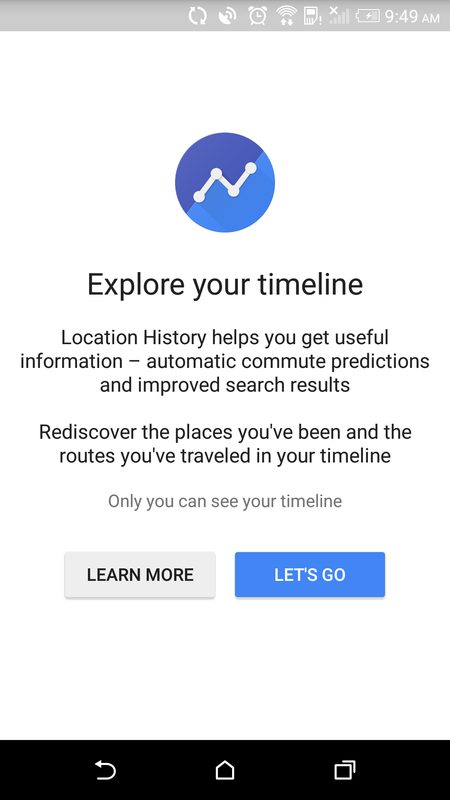 The web page never contained anything more than a bunch of lines and dots strewn about a map, but the new Timeline feature in Maps finally puts some context to the spaghetti-like mess of data that we produce by merely moving around with our phones. 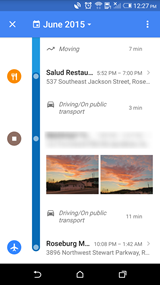 In the Your timeline screen, Maps shows the places you've been, what times you were there, and even how you may have traveled between stops. 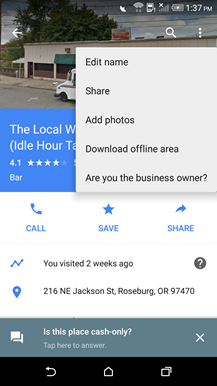 If you've got any pictures from that time and location in Google Photos, they will also appear in the timeline. You can choose days either from the dropdown picker in the action bar, or simply swipe left or right on the timeline to switch days. 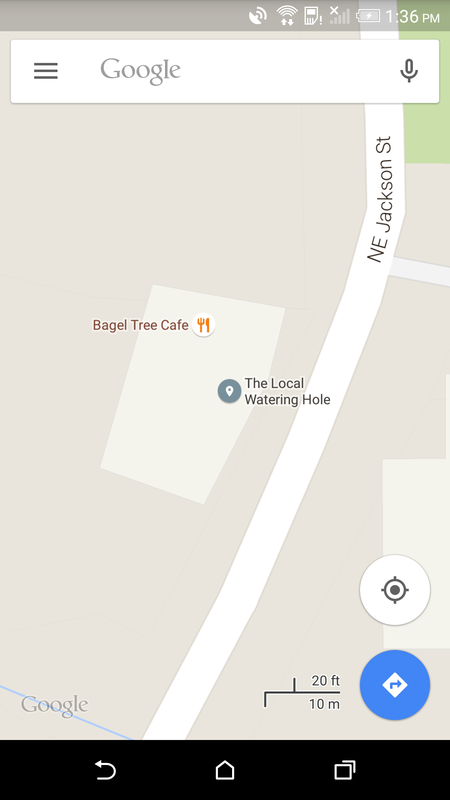 Your timeline can be incredibly handy if you're trying to remember where you found that cute little restaurant with the great bagels or the random road that lead out to some scenic waterfalls. Let's be honest, this is also the first place you're going to turn when you need an alibi, or the first thing your spouse will demand to see when you're 20 minutes late picking her up from work. Yes, having a GPS tracker on your person is a mixed bag of good and bad, depending on how it's used. 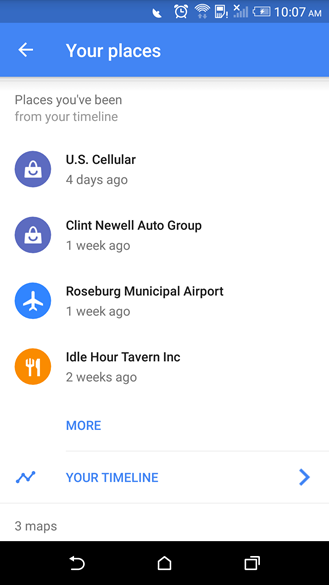 Since Google is mostly guessing about which places you've actually gone to, there can be plenty of mistakes regarding which restaurant or store you may have stepped into. These details can be corrected through edits, or the stop can be erased from history. In fact, if you're concerned with privacy, it's easy to erase a single stop, a whole day, or even your entire location history. I also noticed some strings during the teardown that suggest we'll be able to pause and resume location history, and also an option to turn on a rolling 90-day window where all history is kept until it gets too old, after which it is removed. I don't believe these options are available yet, but they're certainly coming. 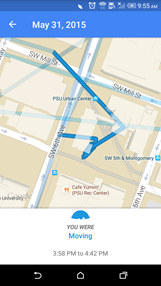 The information from your location history isn't locked away in a single screen, either. 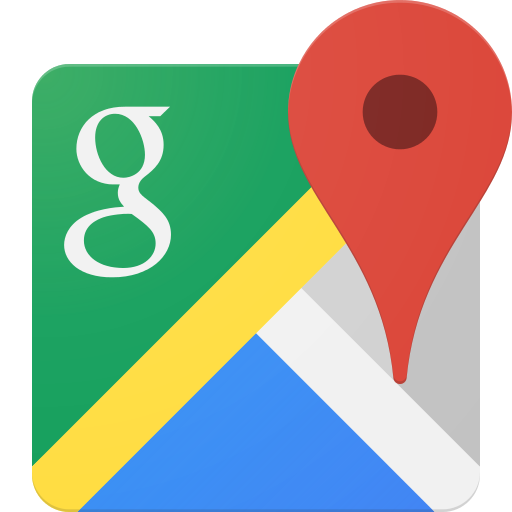 It has been spread out to numerous spots throughout the Maps application. 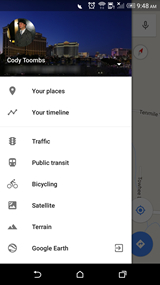 If you open "Your places" from the navigation drawer and scroll down almost to the bottom, you'll notice a short list of Places you've been. There is a link to see a longer list, which appears to encompass stops you've made as far back as 12 months ago. 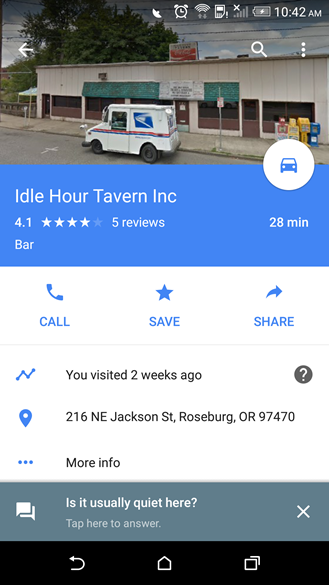 If you check out the detail page on a location you've visited in the past, you'll now see a note to let you know when you last stopped in. After a few days, the message is generalized in weeks and months, so you'll have to work a little harder to get an exact date if you want it. 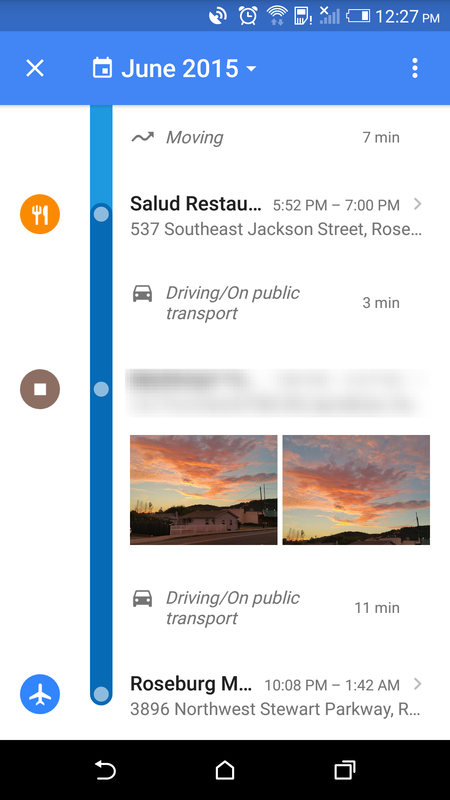 There's also a little question mark to the right that pops up a message to say that any details about your location history are only visible to you. I've renamed "The Idle Hour" to "The Local Watering Hole"
The details screen has another new addition in the form of an action called "Edit name." 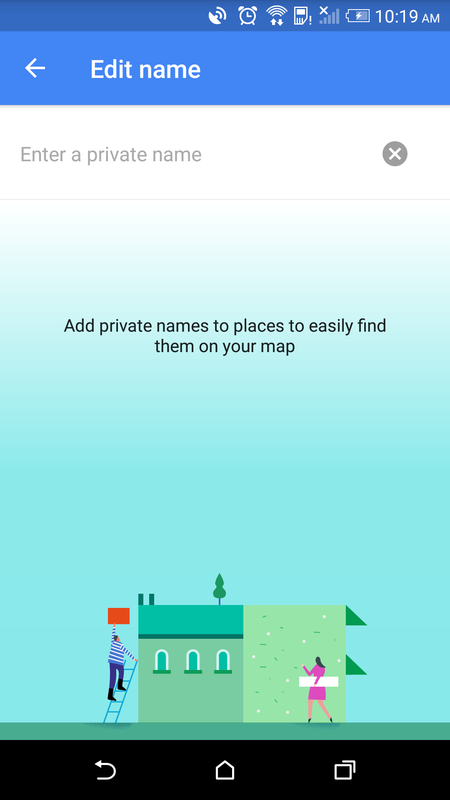 It's now possible to attach a custom name to places on the map, sort of like a nickname. 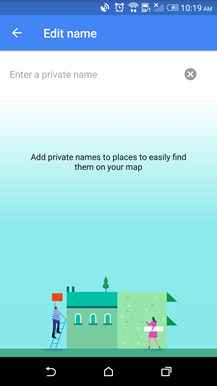 In theory, this is meant to give us an easy way to identify places on a map, mostly by creating more recognizable names. In practice, it doesn't seem to be working the way it's intended. Custom names don't show up in search results, and aside from a bluish-gray icon, they aren't really that distinguishable from any other place on a map. The one useful element of this feature is that locations do show up in "Your places" under the title "Named places." This makes custom names virtually identical to stars (a.k.a. Saved places), but with a slightly higher position on the list. There may be a few other new things in this release, so let us know in the comments if you see anything else. We've got a post coming up with a neat little Easter Egg, and I'm checking out a couple of other interesting elements from a teardown, so keep an eye open for more. 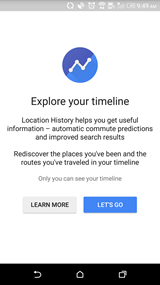 Google has posted an announcement about Your Timeline to the Maps blog.